Hey Guys, are eagerly waiting for the PGIMS Rohtak Assistant Teacher Recruitment 2018? So, we have great news for all those candidates who want to do a Job in Pandit Bhagwat Dayal Sharma Post Graduate Institute of Medical Sciences. Here, in this article, we are going to share all the detailed information about the PGIMS Rohtak Vacancy 2018 in the following section of the article. Interested aspirants must check out this complete article with proper attention and then they may apply for this recruitment from the official website of PGIMS that is www.pgimsrohtak.nic.in. For more details, candidates must have to visit our careerjobs360 page and stay connected with us for further reference. Pandit Bhagwat Dayal Sharma Post Graduate Institute of Medical Sciences Rohtak has revealed the employment notification for PGIMS Rohtak Vacancy 2018 for filling up 106 Posts of Assistant Teacher Posts in the department. The job seeker who is seeking for the Job in Pandit Bhagwat Dayal Sharma Post Graduate Institute of Medical Sciences Rohtak then they may apply for this PGIMS Rohtak Assistant Teacher Recruitment 2018 from the official web portal of the department. You may submit your application form on or before the due date which is 01st June 2018 through Offline mode of application and attend teh personal Interview on 04th June 2018. Moreover details regarding the vacancy such as age limitations, educational qualification, selection criteria, application fee, and how to apply etc. are mentioned below in the article. Pandit Bhagwat Dayal Sharma Post Graduate Institute of Medical Sciences is a graduate medical institute in the city of Rohtak. It is registered in Pandit Bhagwat Dayal Sharma University of Health Sciences. The Pandit Bhagwat Dayal Sharma Post Graduate Institute of Medical Sciences Institute was commenced under the name of Medical College, Rohtak in the year 1960. For the first three years, the candidates were admitted to Government Medical College, Patiala which acted as a host Institution. In the year 1963, the candidates were shifted to Rohtak. In the subsequent years, multifaceted expansion measures have transformed the University into a fully developed center of Medical Education & research in all the major disciplines of Medicine. Following the formation Pandit Bhagwat Dayal Sharma University of Health Sciences in the year 2008, it was incorporated in the university. Educational Qualification: Interested Candidates must have completed MBBS MD, MSDM and M.Ch. from any well-recognized university. For more details, candidates must visit the official advertisement of the recruitment. Age Relaxation will be applicable for the Reserved Category of Candidates as per the government rules and regulations. Selection Criteria: Selection of the candidates will be completed on the basis of their performance in the selection round. 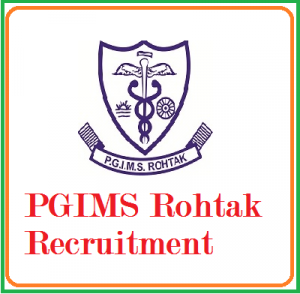 How to Apply for the PGIMS Rohtak Recruitment 2018? Interested Candidates who fulfill all the eligibility conditions those can apply online for PGIMS Rohtak Assistant Teacher Vacancy 2018 from the official website of the department which is given at the end of this article. Aspirants need to submit the application form on or before the deadline date which is 04th June 2018. Aspirants are requested to fill the application form as soon as possible. You can check the below-given steps to apply for the recruitment. First of all, candidates need to go to the official website of the Pandit Bhagwat Dayal Sharma Post Graduate Institute of Medical Sciences department which is www.pgimsrohtak.nic.in. After that, go to Career option and find out the PGIMS Rohtak Assistant Teacher Recruitment 2018 Notification link on the homepage. After that look for the official notification and Download, PGIMS Rohtak Application form 2018. Attach all the required documents and upload the passport size photographs and signature in the application form. At last, submit the application form at “Office of Assistant Registrar Rectt & Estt. Branch Pt. BD Sharma UHS Rohtak, Haryana”. Remit the application fee is required. Take the hard copy of the application form and keep it safe fur further use.